In our previous post, we have discussed a new feature of adding different delivery options for different weekdays in Order Delivery Date Pro for WooCommerce plugin. Now in this post, we will discuss a couple of more features which are added in version 6.0. They are, first available Weekday Before Next Day Cut-off Time and first available Weekday After Next Day Cut-off Time. This feature is useful for the businesses who deliver their product only on some weekdays. For example, you have an online shop where you sell leather jackets, and you can deliver the jackets on next day to your customers. And you do not deliver the products on Saturday and Sunday. So here you want that if a customer visits your website before the next day cut-off time set on Friday, then the first available day should be Monday but if a customer visits your website after the next day cut-off time then the first available day should be Tuesday instead of Monday. 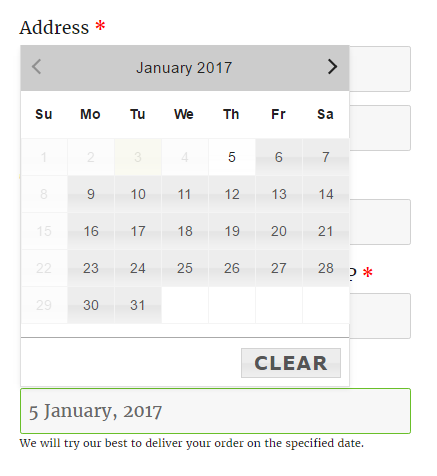 You can set this up under the Order Delivery Date -> Settings -> Weekday Settings tab. The Weekday Settings tab is available only when the Weekday Settings checkbox is checked under General Settings -> Date Settings link. Weekday before next day cut-off time means the first weekday which should be available in the calendar if an order is placed before the next day cut-off time mentioned. For setting up next day cut-off time for delivery you can check the post here. This has detail information about how to setup next day cut-off time for delivery. If you have an online laptop shop where you do not deliver the laptops on Wednesdays. And you want that if a customer visits your website before next day cut-off time, then the first available weekday should be Thursday instead of on Wednesday. So for Tuesday you have to set the next day cut-off time as 12.00 PM and Weekday before next day cut-off time to Thursday in the Weekday Settings tab. Now if any customer visits your website before 12.00 PM on Tuesday, the first available day will be Thursday and not Wednesday in the calendar on the checkout page. Weekday after next day cut-off time means the first weekday which should be available in the calendar if an order is placed after next day cut-off time mentioned. So in above example, we saw that the next day cut-off time is set to 12.00 PM and the first available weekday should be Thursday if any customer visits the website before 12.00 PM. Now if you want that the first available weekday after 12.00 PM should be Saturday instead of Friday, then you can set the Weekday after next day cut-off time to Saturday. So, if a customer visits your website after 12.30 PM on Tuesday. The first available day will be Saturday instead of Friday in the delivery date calendar on the checkout page. In this post, we saw how weekday before next day cut-off time and weekday after next day cut-off time work on the checkout page. We will be discussing more features from the plugin in our future posts.